Hackmon underwent bouts of harsh training, honing its unparalleled battle instincts, and attained this form as it grew together with its spirit, technique, and physical strength. It continues its training as it aims for greater heights, amassing combat experience by battling strong foes and evolving into a skilled warrior the more it battles. As it matures, its aspiration of becoming a Royal Knight grows ever stronger, and it believes that what it is destined to achieve is determined not by what others tell it, but by deciding based on its own observations and inferences. 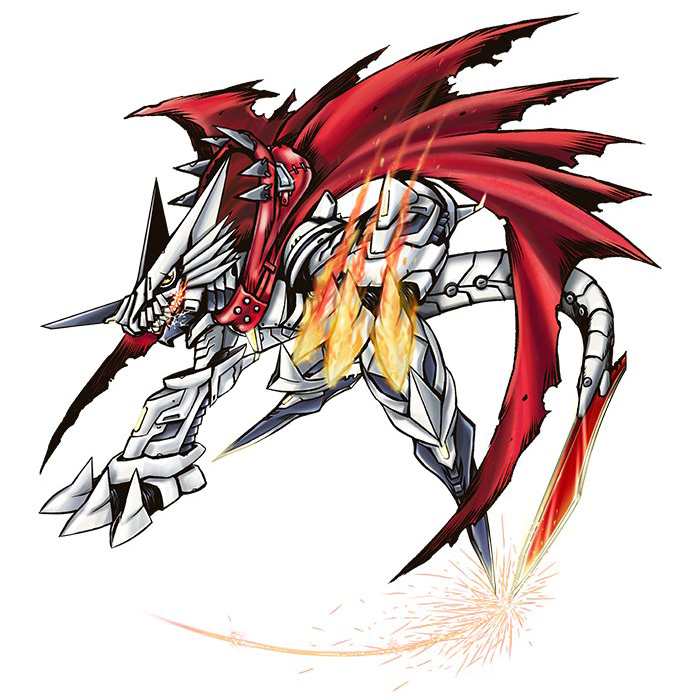 Its Special Moves have all been powered up, and consist of slashing with its claws (Fif Cross), as well as rotating the blade on its tail about its axis and stabbing with it (Teen Blade); the move Burn Flame that it is capable of using for counterattacking has also risen in power remarkably. Furthermore, it is also able to bisect the enemy using the razor-sharp blades that protrude from its hind limbs (Dragrey Spiker). A form of Huckmon that has gone through strict training, intensifying its sense of combat incomparably and achieving growth mentally, technically, and physically. It is a combat expert that aims for the top, continuing its training, accumulating combat experience cultivated through battle with formidable opponents, and evolving as it battles. Its aspirations to the Royal Knights have risen as it grew, and not because it was told what it should do by someone and set its heart on it, but instead because it believes in making decisions by observing and reasoning for itself. From Baou (「刃王」), meaning 'blade lord'. Fif Cross  フィフクロス Fifu Kurosu Slashes with the sharp nails on both hands. Dragrey Spiker  ドラグレスパイカー Doragure Supaikā Kicks the enemy with the blades on its legs. 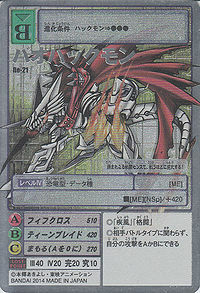 Teen Blade  ティーンブレイド Tīn Bureido Spins its bladed tail like a whirlwind, cutting the foe. With its incomparable combat sense, it evolves as it battles! This page was last modified on 26 March 2019, at 01:09.